National surveys have revealed significant differences in patient outcomes following admission to hospital with acute exacerbation of COPD which are likely to be due to variations in care. We developed a care bundle, comprising a short list of evidence-based practices to be implemented prior to discharge for all patients admitted with this condition, based on a review of national guidelines and other relevant literature, expert opinion and patient consultation. Implementation was then piloted using action research methodologies with patient input. Actively involving staff was vital to ensure that the changes introduced were understood and the process followed. Implementation of a care bundle has the potential to produce a dramatic improvement in compliance with optimum health care practice. Chronic obstructive pulmonary disease (COPD) is a common condition1 with acute exacerbations of COPD (AECOPD) or ‘lung attacks’ causing 12% of acute admissions and being responsible for more than one million bed days per annum in the UK. About a third of patients are readmitted within 90 days of discharge.2 Significant variations in outcomes and provision of care have been noted, implying a role for a systematic quality improvement approach.2 3 We therefore wished to develop and pilot the implementation of a COPD discharge care bundle—a list of five to six evidence-based practices that should be delivered to all patients.4 A care bundle does not specify the entirety of care that should be delivered, but is rather a group of items that administered together should be delivered to all individuals. Item selection was based on national and international guidelines, a systematic literature review and input from a multidisciplinary project team described in more detail in the online supplementary material. The project team undertook a process mapping exercise to map the patient pathway from admission to discharge and follow-up. A survey, undertaken to identify elements that were important to patients, identified feelings of isolation and a lack of support postdischarge and prioritised regaining physical function. To ensure coherence within the wider health community, the bundle was discussed at meetings of the Inner Northwest London Care Community integrated service improvement programme for COPD. Follow-up appointment to be made with a specialist prior to discharge. 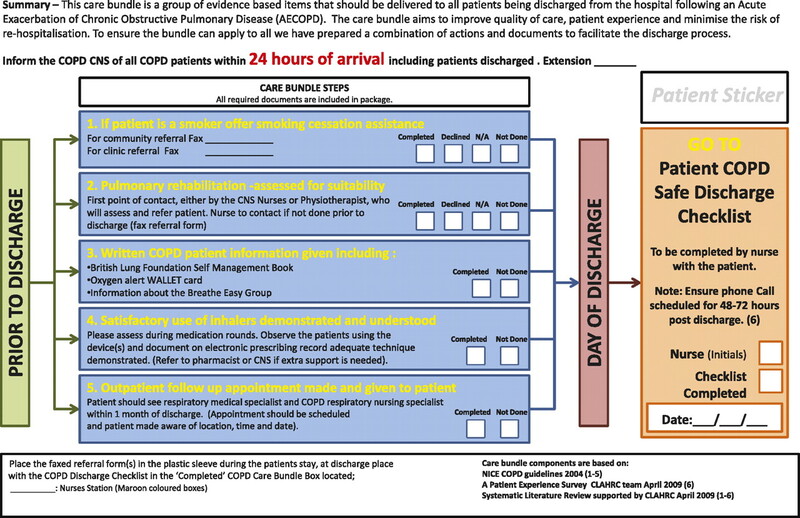 The chronic obstructive pulmonary disease (COPD) discharge care bundle. CNS, clinical nurse specialist. The care bundle pack included all the relevant referral forms/fax numbers. Referrals could be made by ward nurses, physiotherapists, clinical nurse specialists or doctors. Patients completed a ‘safe discharge checklist’ (online appendix 1), which would be countersigned by the nurse responsible for their discharge, providing an opportunity to address any omissions and to reinforce ward nurses' knowledge of the bundle items. Thus, for example, if at the end of several days in hospital a patient's inhaler technique had not been reviewed (despite their having used their inhalers on multiple occasions), identification of this omission would motivate the discharge nurse to ensure that this was not neglected in future. The safe discharge checklist also included a section to be completed about what to do if the patient felt they were not improving and needed further medical input once they were at home. Patients were also offered a brief phone call 48–72 h postdischarge to check whether they were improving. If not, community input could be expedited. A script was developed with standard questions such as ‘Since discharge are you same/better/worse?’; ‘Is your breathing keeping you awake at night’; ‘Do you have a written self-management plan’”; ‘Do you know what your follow-up plan is?’ (online appendix 2). The clinical nurse specialist making the call then decided whether there was an immediate cause for concern. The care bundle was launched on the respiratory ward at a series of multidisciplinary meetings. A survey of ward staff during the development of the project had revealed low levels of confidence regarding inhaler technique, smoking cessation and pulmonary rehabilitation, so it was clear that staff education would be important. An initial barrier to this was that it was difficult for the staff to attend teaching sessions in a group without impeding clinical work. We developed an educational model where members of the team would spend time on the ward at a stand providing teaching about topics such as smoking cessation and inhaler technique in a ‘drop in’ way. Thus, during the course of a shift all the nurses on the ward had the opportunity to be educated with minimal disruption. This led to improved confidence in these areas, which was confirmed by a staff survey. Pharmacists involved in the project took the opportunity to teach on a daily basis and developed laminated pictorial charts to attach to the drug trolley to reinforce the correct inhaler techniques required. Care bundle returns were assessed at the weekly project meeting, which enabled the team to refine the administrative and other processes involved, through the use of a ‘plan, do, study, act’ approach. To increase engagement with the project, the ward nurses completing the safe discharge checklist were entered into a draw for a small prize. Pulmonary rehabilitation has a key role in COPD management and there is evidence that it can reduce accident and emergency attendance and readmission if delivered immediately after discharge with AECOPD.5 In order for health professionals to refer patients and to improve patient compliance, it is important that they have a clear understanding of what it entails and are able to communicate the strength of evidence for its effectiveness. To address this, ward staff attended pulmonary rehabilitation sessions within the Hospital and physiotherapists gave informal teaching. An information leaflet for potential participants was developed with input from patients to ensure that it was written in an appropriate language and addressed typical patient concerns. The care bundle was initiated in 94 patients on the respiratory ward between 1 October 2009 and 30 September 2010—age 74.6 (11.2) years, 64% male, median length of stay 6 days. Compliance was compared with a random sample (n=22) from the year sampled prior to the project as part of the bundle development process. There were significant improvements in compliance with reference to smoking cessation (18.2% vs 100%), pulmonary rehabilitation (13.6% vs 68%), administration of self-management plan (54.6% vs 97.9%) and review of inhaler technique (59.1% vs 91.2%). Follow-up arrangements were documented in 41% pre and 39% post initiation of the care bundle. Of those in whom the bundle was used 25.5% were smokers. All were offered an appointment with smoking cessation services, although 11 (46%) of the smokers declined to be referred. In the year prior to the bundle, there were 31 referrals to pulmonary rehabilitation for Chelsea and Westminster patients compared with 81 in the year postinitiation—an increase of 158%. Four (4%) patients declined to receive a follow-up phone call, 34 (36%) could not be contacted despite two calls and in 22 (23%) the call was not made because of staffing issues. A follow-up call was made successfully in 34 (33%) patients and a cause for immediate concern was identified in 3 (10%) of them. Contact details for many patients were wrong in the electronic patient record, so the safe discharge checklist was modified to include reviewing the contact details in an attempt to address this. The 30-day readmission rate was 10.8% for patients where the bundle was used compared with 16.4% where it was not (n=365) (95% CI for difference −2.1% to 13.2%). After implementation of the bundle, there was a downward trend in readmissions but segmented regression analysis showed this not to be statistically significant (figure 2). The aim of this initial study was to demonstrate improvements in process (since the interventions themselves have an evidence base); however, the findings are encouraging and as this intervention is rolled out across further sites the data will become available for a more quantitative evaluation of the link between these process measures and outcomes. In addition, data for this analysis included all patients admitted to the Trust with AECOPD (n=1156) over 3 years, whereas the bundle was only piloted on the respiratory ward. Although the implementation of the bundle might have improved COPD awareness generally within the Trust, looking at total readmission rates is likely to have diluted the actual impact of the bundle. The 30-day readmission rates before and after the initiation of the chronic obstructive pulmonary disease discharge care bundle. Educational efforts must be maintained because of staff turnover and need to be delivered in a way that is easy for staff to access, enabling them to gain and maintain confidence. For the care bundle to be implemented effectively, all healthcare professionals involved in COPD care need to be able to engage with it. We would like to thank all the staff who participated in the project and the patient representatives, particularly Mr Allan Stone.
. COPD in England: a comparison of expected, model-based prevalence and observed prevalence from general practice data. 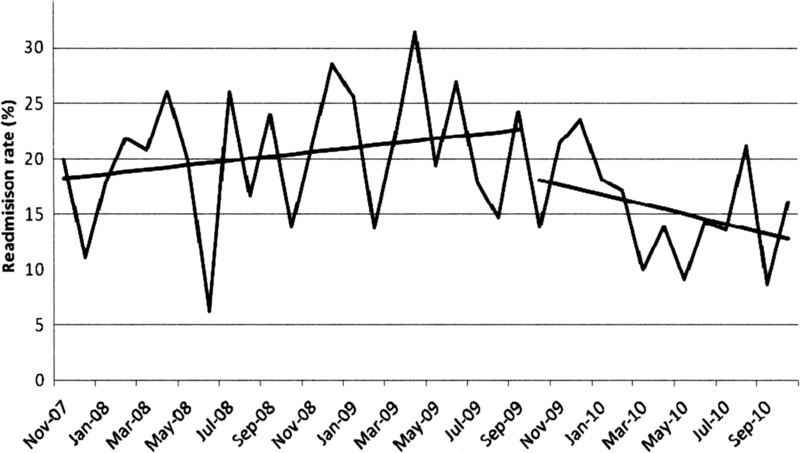 J Public Health 2010;33:108–16. doi:10.1093/pubmed/fdq031.
. Report of The National Chronic Obstructive Pulmonary Disease Audit 2008: Clinical Audit of COPD Exacerbations Admitted To Acute NHS Units Across the UK, The Royal College of Physicians, London, 2008. http://www.brit-thoracic.org.uk/Portals/0/Clinical%20Information/COPD/NCROP/NCROPClinicalAudit.pdf.
. BLF and BTS “Ready for home” survey of the experiences of patients admitted to hospital with COPD. Pt2: the discharge process. Thorax 2010;65:A175.
. Using care bundles to reduce in-hospital mortality: quantitative survey. BMJ 2010;340:c1234.
. Outpatient pulmonary rehabilitation following acute exacerbations of COPD. Thorax 2010;65:423–8. Funding The work was funded by the NIHR through the Collaboration for Leadership in Applied Health Research and Care (CLAHRC) for Northwest London and the NIHR Respiratory Biomedical Research Unit of Royal Brompton and Harefield NHS Trust and Imperial College. Ethics approval The study was discussed by both the Brent Ethics Committee and the NHS Brent R&D Committee who determined that formal ethical approval was not necessary.